S2 takes shape from the conviction that creating common areas is needed to support a positive evolution of society, an economic growth and to win challenges of climate change and pollution. Sharing spaces, experiences and costs between us and sharing land with nature is a key part of the solution. S2 takes inspiration from good examples of the past: the traditional Norwegian house, an efficient structure, a safe shelter with low environmental impact. This structure it has been used as a guideline for the new houses: detached from ground, avoiding a conflict with nature, and with most of private green on the roof. Furthermore, the byggeskikk‘s core is the fireplace, a place for joining family life. In the same way, S2 shared spaces are thought to be the core of life of the inhabitants, places for exchange and amusement. The landscape is a changing environment: water and built share the same land, and play a key role on defining the space. 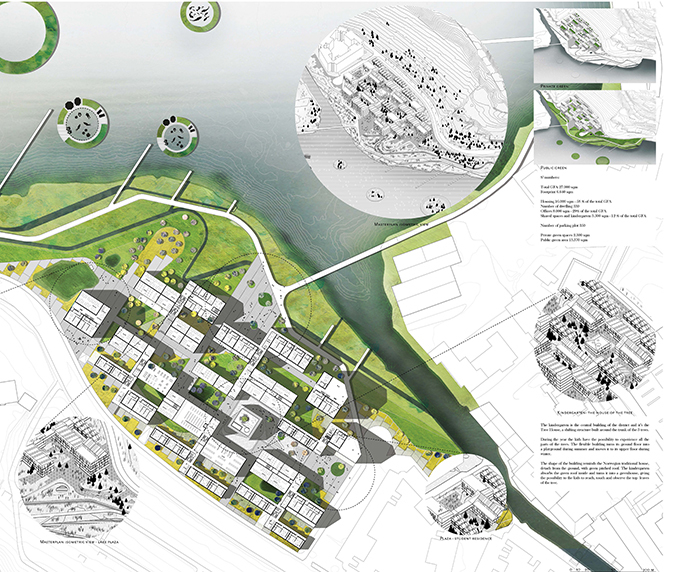 Terrain changes its shape to allow the water in, when needed, giving a safe space to residents and to pedestrian paths which run above the sea, as peers and over the land, as plazas and connections.